With Variants, Examples and Advice for Playing and Improvising on any instrument. Edited by Pascale Boquet, Gerard Rebours. Music Books/CDs. Teaching Works. Level: Grade 0. 144 pages. Published by Editions Fuzeau Classique - France (French import). ISBN M049063968. 21 x 30 cm inches. 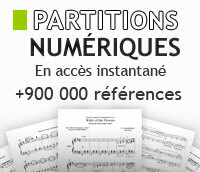 Here, brought together for the first time, you will find 50 Renaissance and Baroque ostinato basses, songs and dances on which composers repeatedly wrote variations over the course of decades or even centuries. These pieces circulated from country to country, from one publication or manuscript to another, and also served as a basis for improvisation by performing musicians of the time. 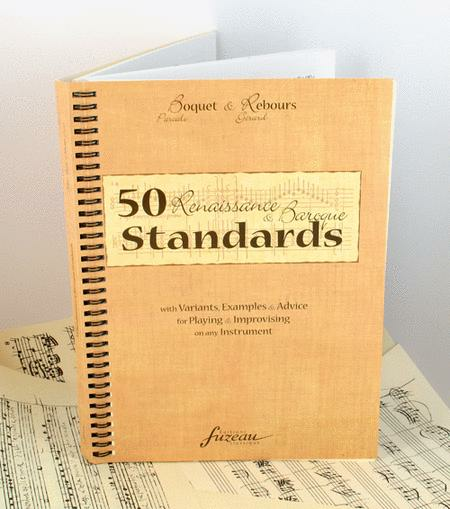 In the tradition of Jazz Standards anthologies, Pascale Boquet and Gerard Rebours have assembled over a hundred pages of the 50 most-used pieces in their basic versions, followed by transpositions and a selection of 210 variants and common derived forms. The examples are enriched with explanations, comments, historical notes and references, supported by the final glossary and bibliography. A generous preface provides theoretical analysis and practical hints for improvising. These 50 'Standards' are presented in increasing order of difficulty, and the musical examples may be used on three levels: - The tunes are often easy, so beginners may play them as written. - Musicians somewhat acquainted with the subject will be able to begin writing a few divisions or variations. With more experience, players can launch into free improvisation with no "safety net" , as one should. In addition, whether playing on modern or period instruments, any musician or group will be able to approach this repertoire in the following ways: - The melodic instruments (flute, violin, viol, oboe. . . ) can play and vary the tunes and dances. - Polyphonic instruments (keyboard, lute, guitar, harp) may accompany from the figured bass in various ways, and also realise independent versions by playing and varying the two parts at once. Low instruments (bass viol, bassoon, cello. . . ) will take the bass line, without neglecting to add their own diminutions and variations. Lastly, this study provides an opportunity to explore a considerable part of the basic 16th and 17th century repertoire, while going deeper into certain harmonic, melodic and stylistic aspects characteristic of each period, each country and even each composer. Broadening the perspective to include improvisation, a practice not yet familiar enough, will add a new dimension to the approach to early music. For a complete presentation, see www. 50Standards. com Table of contents : Introduction Genesis Standards Editorial principlesImprovising (G. R. ). The improvisatory gesture. Divisions, diminutions, fredons, passaggi, glosas. . . Improvising, according to treatises. A division lesson. Practical advice for improvising (P. B. ). Analysis of two well-known Standards : 1-Passemezzo Antico (P. B. ) 2-Folies (G. R. )50 Renaissance et Baroque Standards Glossary Primary Sources : 1-Theoretical works 2-Musical publications 3-Manuscript compilations Secondary Sources The authors Acknowledgements Index of the 50 Standards Index of composers and works ! Beautifully designed and printed, /. . . / the book is timely as well as valuable. There is no equivalent, practical edition ! (A. Robinson, Recorder Magazine, England. ) ! Beware, this book is dangerous ! Once you have opened it, you will never want to be without it again. ! (J. Cordaro, Lute Society Bulletin, Belgium) The book we have all been waiting for. /. . . / Recommended to everyone. ! (Nostalgia, Japan) Congratulations to the authors ! ! (D. Pistonne, Professor at the Sorbonne University, Paris).